LASIK - What is It? LASIK surgery, also known as Traditional or Conventional LASIK, is an FDA approved, safe, and effective way to treat many vision correction problems. Using the Traditional LASIK procedure, the patient’s visual prescription is measured using the same method that would determine their prescription for eye glasses and contact lenses. The information provided from these measurements are entered into an FDA approved computer laser. The laser then effectively guides the doctor in reshaping the patient’s cornea during the LASIK procedure. LASIK is performed to correct nearsightedness, farsightedness and astigmatism. In most treatments, LASIK is painless and completed within several minutes per eye. The results of LASIK will improve your vision to reduce, and in most cases eliminate, the need for eye glasses or contact lenses. The results of the LASIK procedure can usually be noticed within 24 hours. Like most types of refractive eye surgery, LASIK reshapes the cornea to allow the light entering the eye to be specifically focused on the proper part of the retina to obtain clearer vision. There are multiple LASIK vision correction surgeries available, such as PRK, LASEK, Custom and all-laser Bladeless LASIK. What is LASIK Surgery? Is LASIK Right for You? 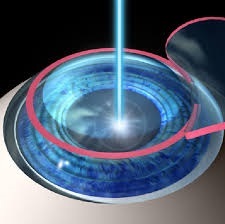 The LASIK procedure itself is the same for both Traditional and Custom LASIK. During the Custom LASIK procedure, a comprehensive map of the patient’s eye is created, while Traditional LASIK relies on feedback from less detailed measurements. Traditional LASIK surgery is effective for treating lower-order aberrations, such as myopia, astigmatism and hyperopia. Custom LASIK treats lower-order aberrations as well as higher-order aberrations, which can help minimize complications such as halos, glare and starbursts.